Sorry for missing last week's review - I realized late Saturday night that I hadn't posted anything for Friday morning, and by then it was too late to do anything, so I figured I'd just wait until I had something solid to post, rather than cobble something together. Nothing but the best for my readers. So today, I'm going to talk about something that's been in my freezer for quite some time. I'd made a big fake meat purchase at Trader Joe's a while back, about half of which was refrigerated stuff and half frozen, so I had to use up all the non-frozen stuff first. You know how it goes. So here comes my next Trader Joe's review. As recommended by j spiker here, I decided it was time to try Trader Joe's Corn Dogs. Easy enough preparation - bake at 350 degrees for 20 minutes. Nothing fancy - it's just a frozen corn dog, for crying out loud. Usually, when I get frozen real-meat corn dogs, I have to bake them for quite a bit longer than indicated, to get the level of crispy-crunch I like. These, however, were super crunchy and perfect at the end of the prescribed 20 minutes. I was pretty excited to dig in, to be honest. Texture is a big thing for me. So, I busted out some ketchup (much as I try, I just can't get into mustard), and took a big, optimistic bite. Luckily, I was not disappointed. The texture of the cornbread part was awesome! Ditto the flavor! Just like the real-meat corn dogs I like. However, the dog part was a little different, as you'd expect. A little background - when I get real-meat corn dogs, I prefer the beef dogs to the pork (or, as my favorite brand calls it, "classic"), because they have a more meaty flavor. Pork hot dogs just don't cut it, ever since I switched to beef hot dogs. So I've built up a pretty high standard for corn dogs. Once I got over the fact that it wasn't beef, I was able to fully embrace the experience. No weird flavors from the dog - at least, none that I could detect over the taste of the cornbread - and the texture was just mushy enough to simulate a cheap hot dog (the kind with ingredients that you try not to think too much about). There's a very good chance that we'll eat these again. They are close enough to satisfy a corn dog craving (at least, for me), and are drastically lower in fat than a real-meat corn dog. We're talking about a 65% reduction in fat, here, plus a bonus 3 grams of protein per corn dog. The calorie content is relatively similar, but if you're concentrating on eating less fat (especially saturated fat) and cholesterol (no meat = no cholesterol), then this is a good way to go. Well done, Trader Joe's - you've restored my faith in your products. Until next time, perhaps. We'll have to see. Flavor - Cornbread part was great - hot dog part didn't have a great deal of flavor on its own, but it's not intended to be eaten on its own, so who cares? I loved these things! They were great, and I'd totally eat them again. Kudos to you, j spiker. 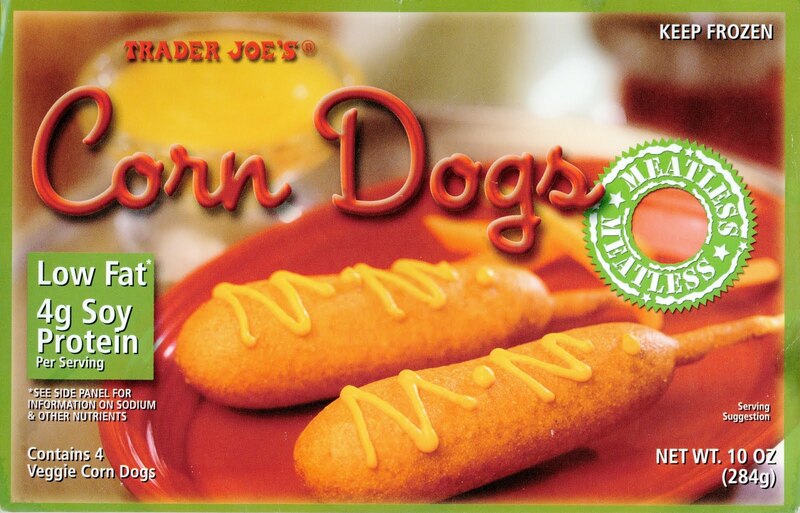 Just to clarify, those Trader Joe's corn dogs are vegetarian but not vegan because they contain eggs (from what I remember). Eggs and dairy contain cholesterol but these probably have so little it rounds down to zero. You are correct - these are not vegan, hence no vegan tag. Egg whites (which these contain) do not have cholesterol - just the yolks. Whey, however (which is dairy) does have a little bit, but there's probably not enough in these to require them to count it on the label. Has anyone found fake corned beef? Either sliced or a loaf style. There is a corned beef roll made by Worthington now owned by Kellog. Hard to find tho. If you live near a Seventh Day Adventist church, check there. They have the best selection of veggie meats in our area, including the delicious Worthington Dinner Roast! hey, just noticed this post! i'm glad you guys liked, i eat these pretty regularly. they're pretty decent microwaved too if you don't have time to bake. i've also successfully cooked them in a toaster oven but you have to cut off the stick. Actually, last time I checked, these aren't even technically vegetarian. The coloring comes from bugs. I prefer the Morningstar ones. These were so flavorless to me.